Libby has now been sold to Yaldool Working Kelpie Stud at Braidwood. Noonbarra Libby is a pretty little thing and like all our Kelpies has a smooth way of working and shows beautiful style and eye on a few sheep. She has excellent break-out, cover and footwork and is very keen. She has no problem getting sheep out of a corner or off the rails in a stockyard. She has many other high qualities that are often not found in Kelpies today. 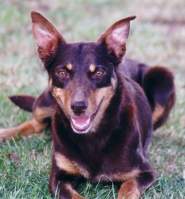 Libby is a very athletic looking Kelpie and is a fast, agile dog too. Her breeding is very important for a number of reasons. She is a full sister to Noonbarra Jillaroo and Noonbarra Milo in America. Her breeding brings in some of the greatest Kelpies of all time including Liscannor Pace, Rockybar Buff, Le Cliff Jock, Glendon Claude and many others. 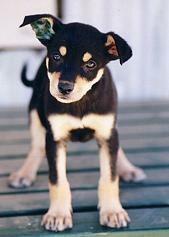 She goes back to our best Kelpies including Noonbarra Tina and Noonbarra Gabe. Of special interest is that her breeding doesn't have any Capree, Phils Creek or Karana blood which is unusual and makes her special as most breeders in Australia have now hooked onto this trio of Yard Trial breeding lines. Noonbarra Libby is one of those sweet natured dogs that doesn't cause any problems and just loves to get a pat and a kind word. She is a wonderful mother and looks after her pups very well. She is a happy dog and a delight to be with. Noonbarra Libby's working style is smooth and pretty to watch. She is gentle and calm with the stock but has plenty of presence and power to shift them if they try to take her on. She has a lot of the classic style about her a just the right amount of eye. Lovely balance and footwork and especially good at holding the mob and turning them out of corners or off the fenceline. She also has excellent ability on a few wild sheep too. Noonbarra Libby was mated to Karrobar Moss in 2001. 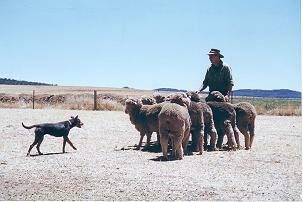 Moss has been selected to represent Australia twice in overseas sheepdog trial competitions. He has also won the NSW State Yard Dog Championship. A very good dog on big mobs, cattle or in the stockyards. Libby whelped seven pups to him and we kept on Noonbarra Roy and Noonbarra Kate for future breeding. 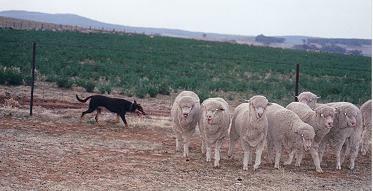 Noonbarra Scott went to a customer in Germany for work on sheep and cattle, Noonbarra Mac went out west to West Wyalong for sheepwork, Indy and Calis went to Sydney as companion Kelpies, Mack went to our old customer John Maxfield out near Mudgee for sheepwork. 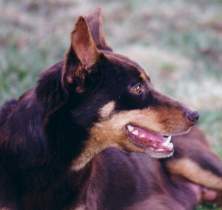 John also owns Noonbarra Boris, a great Kelpie that has been used as a sire by other breeding studs. But Boris was getting old, born back in the 1980's. 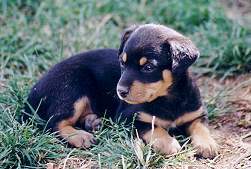 Noonbarra Libby was mated to Capree Cobb (son of Capree Boss II, State Champion) and produced nine puppies in October 2002. One of these Noonbarra Gabrielle went all the way to the United States of America. We have kept Noonbarra Molly in the Stud. She has been one of our best producing young females and has grossed the Stud well over $12,000. The green in her ear is the dye from her Stud Tattoo. It flakes off after a few days.